Where do you put a deck when your home has nine sliding glass doors? 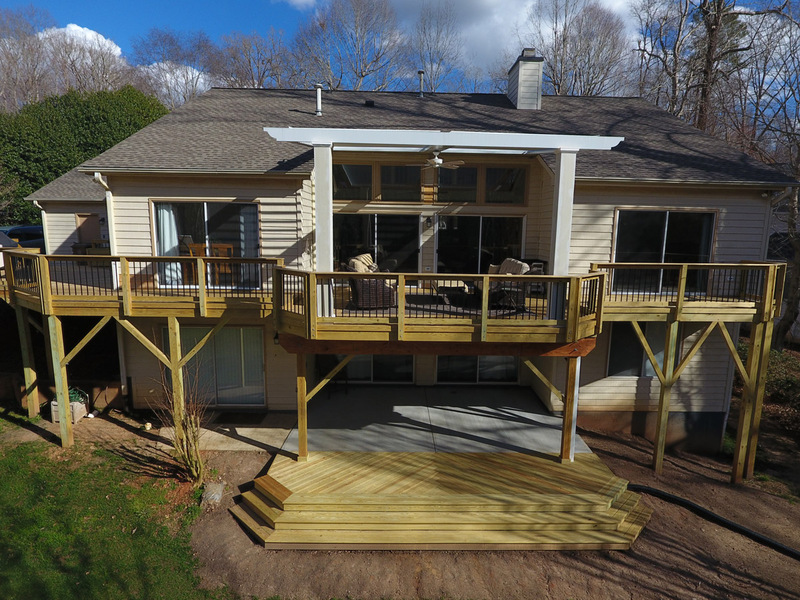 This Cary family asked Archadeck of Raleigh-Durham and the Greater Triangle to create a custom-designed outdoor space for their home, which features nine sliding glass doors on the backside. To maximize the family’s use of its many doors, we created a unique combination project that allows each of the doors to open to a comfortable backyard retreat. An outdoor dining and kitchen area, an upper-level lounge complete with an adjustable pergola, and a dry, covered patio downstairs offer multiple settings for enjoyment and relaxation regardless of the weather. This home’s main living room enjoys a great deal of natural light streaming in through two sliding glass doors with transom windows above. The homeowners’ design challenge was that they wanted shade on the deck directly outside of the living room but didn’t want to diminish the light coming into the house. 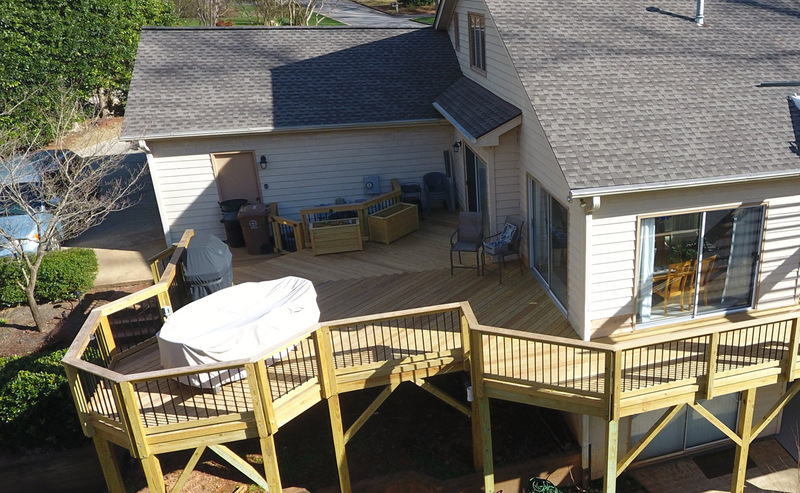 At Archadeck of Raleigh-Durham, we pride ourselves on finding innovative outdoor living solutions to meet our clients’ unique needs. 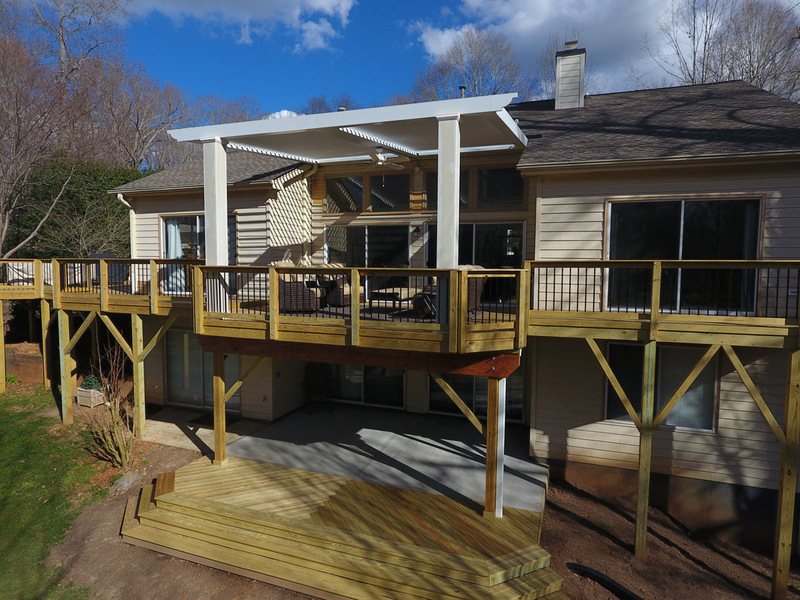 To meet this particular design challenge, we installed an Arcadia Adjustable Pergola over the deck. 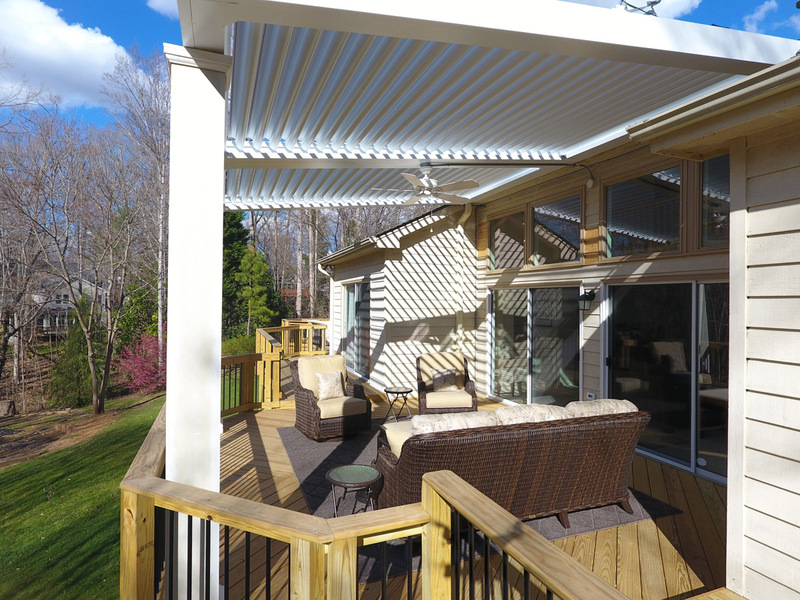 The Arcadia System offers a flexible shade solution with louvered roof panels that can be adjusted to let in full or partial sunlight, or to provide complete coverage. In fact, the Arcadia System features a built-in rain sensor that will automatically close the louvers when it detects inclement weather. Three of the clients’ glass doors open from the kitchen and dining room onto their new deck. In order to create a seamless transition between their indoor and outdoor dining spaces, we designed this portion of the deck to be large enough to accommodate a dining table and barbecue grill. With a modern diagonal decking pattern and pressure-treated pine, this Cary deck is as beautiful as it is functional. The deck’s railing features black aluminum balusters, which allow an unobstructed view of the back yard. The aluminum balusters are also a terrific low-maintenance alternative to wooden spindles. To further refine the new outdoor dining space, we added a gated fence and two matching planter boxes to conceal the nearby air conditioning units with plants and flowers. The planter boxes are on wheels, so the homeowners retain the flexibility to move them to other areas as desired. The walkout basement’s three glass doors open onto the back yard at ground level. The small existing patio did not take full advantage of the abundant opportunity for additional outdoor living space here. 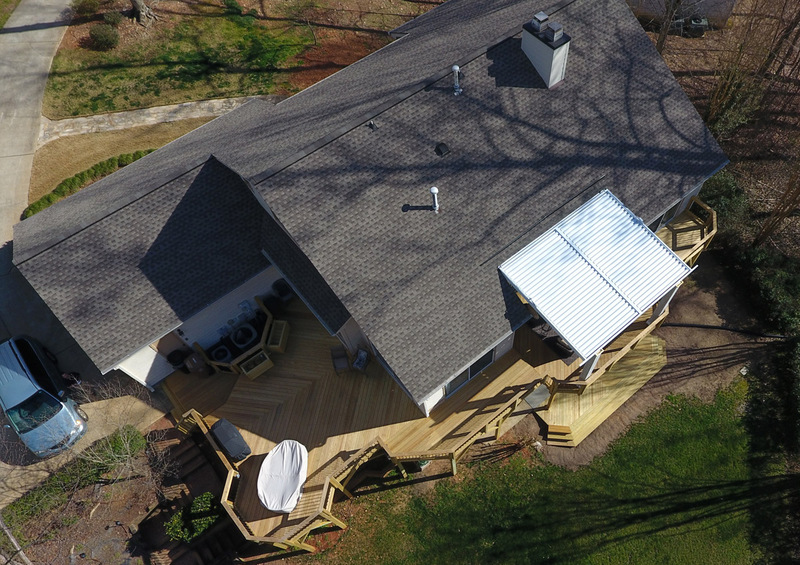 An expanded patio now offers this family a permanently dry and shaded outdoor area under the deck for new seating and direct access to the yard. In creating this new outdoor living area, the first thing we did was add TimberTech’s DrySpace to the deck above the patio. 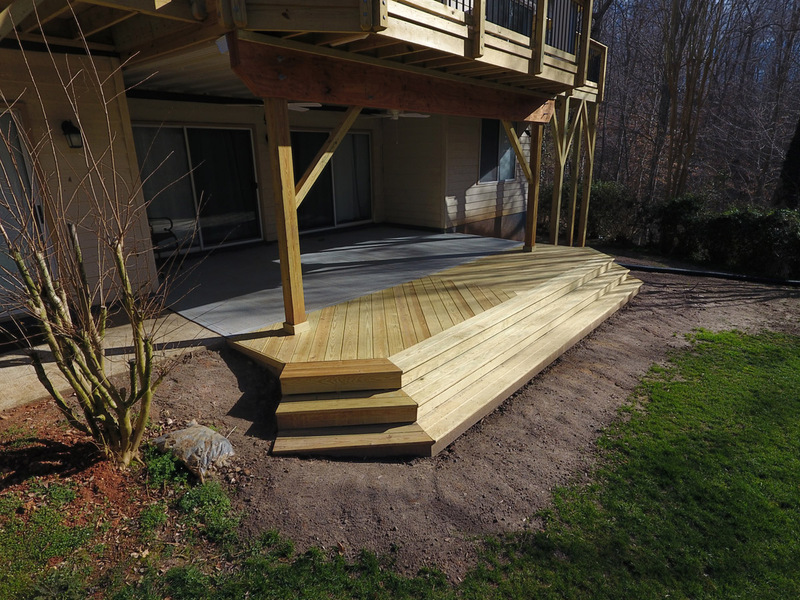 The DrySpace is a vinyl drainage system that is installed underneath the deck, directly to the deck’s framing. The system channels water runoff to a gutter system, which is piped away from the house. This keeps water away from the home and the area underneath, maximizing the functionality of the patio space. Next, we extended the concrete patio to make a larger, more functional lounging, dining, and entertaining area at that level. We tied the upstairs and downstairs areas together visually with a pressure-treated wood landing and cascading staircase leading from the concrete patio into the yard. Not only do the homeowners have an easy passage from the patio to the yard, but the wide staircase provides additional seating during large gatherings. Given this home’s exceptional design and the homeowners’ desire for shade, we were pleased to provide two shaded outdoor spaces for the family to enjoy without sacrificing the benefits of their home’s bright and airy features. If your home presents a unique design challenge or opportunity for bringing the comfort of indoors outside, call Archadeck of Raleigh-Durham and the Greater Triangle today at 919-973-1523. 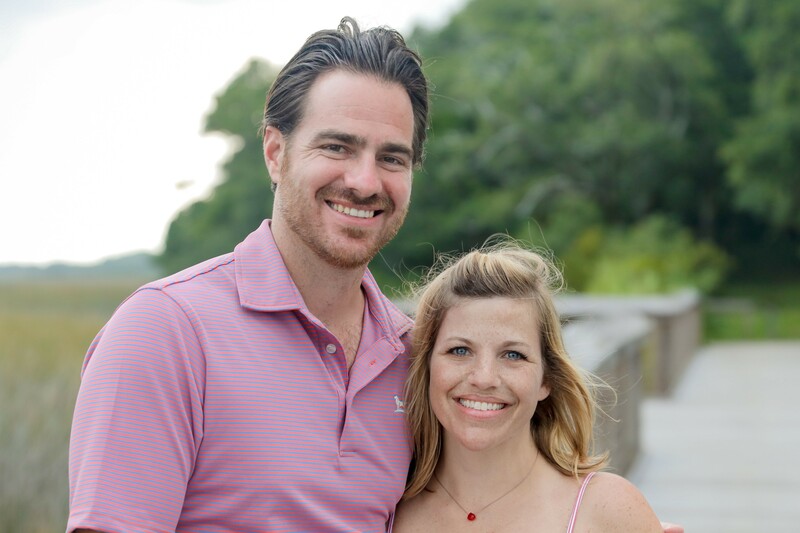 We work closely with every client during the design phase to meet their unique goals, and we look forward to working closely with you!